So a tank had been found, not far from the original site indicated by Madame Bouleux, who unfortunately died before the dig. But which tank was it? At first, a study of the battle graphs written after the battle by the Company Commander suggested the tank might be D47 Demon II. But the unearthed tank was ‘Female’ - and D47 was ‘Male’. Which other ‘Female’ tanks were recorded as being destroyed and abandoned close to the burial position? The closest on the battle graphs and reports were D32, D41, D11 - and D51. Unfortunately, positions given in battle graphs are not always accurate; they were written a few days after the action had finished, because Commanders would be pre-occupied and exhausted during combat. In addition, some of Commanders were missing or killed and the information was given by other officers. This has led to some inaccurate assumptions being made by other researchers and published on some websites. So why was the team positive in its identification of D51 Deborah? It was a combination of these reports, original aerial photographs and other documents. In one original photo of the tank being buried, the full number ‘51’ can be clearly read. When the earth was carefully removed after the excavation, a slight trace of the original marking appeared on the petrol tank; it was a part of a number ending in ‘1’. Cross-checking indicated that it could only be one of three tanks, D41 Devil II, D11 Dominie or D51 Deborah. By an amazing coincidence, when David Fletcher, the Curator of the Tank Museum returned to England following the ceremony at the discovered tank, he received a letter requesting information about an enclosed photograph of a damaged tank. Mr Fletcher’s keen interest and sharp eye noticed that the tank photo had the same damage as the tank he had just seen in Flesquieres. On the back was written ‘Mr Heap’s Bus’. 2/Lt. Frank Gustave Heap had commanded D51 Deborah. The request for information had come from his grandson, William Heap. Frank Heap was awarded an MC for guiding half his crew to safety after Deborah was disabled by shell-fire. Before the war, Frank Heap won a scholarship to read History at the University of Cambridge, where he was a sporting Blue. After 1918, he ran a hotel in Blackpool and became a renowned mountaineer. He also wrote a book about petrol cars and lorries. 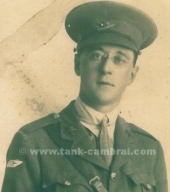 William Heap subsequently visited Flesquieres to see his grandfather’s tank, and enjoyed a vin d’honneur at the Mairie in the village. Other members of the family have also visited, and provided many photos and documents which add to the story. Four members of Deborah’s crew died when she was hit on November 20th, 1917. Who were they? There are four headstones side-by-side in Flesquieres Hill Cemetery, not far from where it’s almost certain Deborah was disabled. They each mark the graves of Tank Corps men from Deborah’s ‘D’ Battalion, all killed on November 20th. John Heap, Frank’s great grandson, a teacher in Cheshire, is part of a team trying to find out more about Deborah’s casualties. One of the four was Gunner William Galway, who was 25 when he died. Research so far has led the team to his family in Northern Ireland. Other names on the headstones are: Lce Cpl G.C.Foot, Gunner J.Cheverton and Gunner F.W.Tipping. By lengthy and painstaking research, much information on these soldiers has already been located and is included in the later section 'The Men of Deborah D51'. Enquiries continue, and anyone with any information is invited to contact this website. Details will be included in the proposed Museum, to honour the men who died.